Want to find the best items in Diablo 3? This is your must have app. 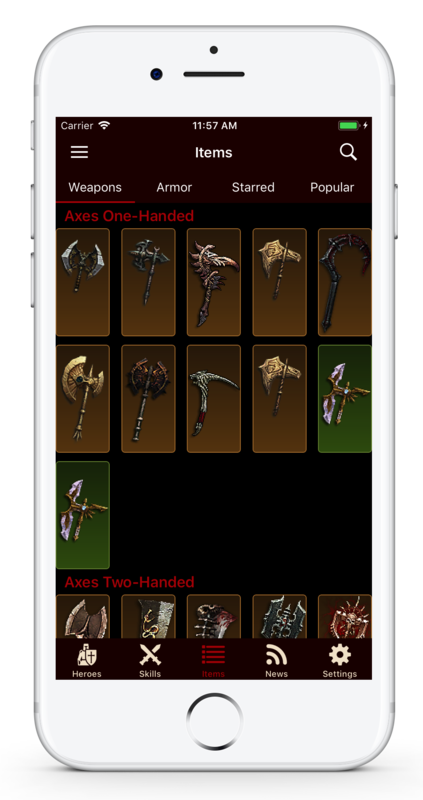 This app brings Diablo 3 item database to your iPhones and iPads. The app includes legendary and set weapons and armor. You can compare your hero's equipped items with the database items side by side. Offline build calculator allows theorycrafting on the go. ★ Works offline after initial setup. ★ Language supports English, Chinese and Korean. ★ Friendly user interface with both list view and grid view. ★ Items can be searched by item name, type or magic properties. ★ Compare hero items with database items side by side. ★ View and share hero stats and skills. ★ Great sharing feature allows you to share items to Facebook friends or through email. ★ The starred list helps you to keep track of your favorite items. ★ Diablo 3 news feed. ★ BattleTag search supports U.S., Europe, Taiwan, China and Korea. RoS version 2.4 items and skills are fully supported. Necromancer items and skills are included.